Pretty much everyone saw this one coming. Denard was an obvious choice for offense, and you won't find a much better choice than Jordan Kovacs for the defense. Denard was the QB that nobody wanted. RichRod gave him a chance and he proved himself worthy of the starting role. For Jordan – from unknown walk-on to starter to senior captain – a great story for one of Michigan football's most likable players. Both of their stories are about as unique as it gets. 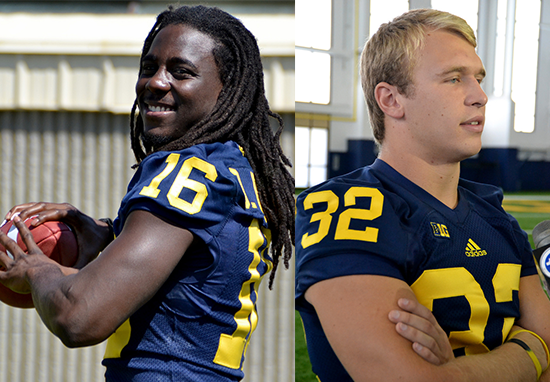 ANN ARBOR, Mich. -- University of Michigan football head coach Brady Hoke announced Sunday (Aug. 26) that seniors Jordan Kovacs (Curtice, Ohio/Clay) and Denard Robinson (Deerfield Beach, Fla./Deerfield) have been elected captains of the 2012 football team by a vote of their teammates. "Denard and Jordan are two guys who represent what Michigan football stands for, on and off the field, and they certainly are deserving of being named team captains," said U-M head football coach Brady Hoke. "They have played a lot of football here. I know they will do a great job of leading the seniors and Team 133." Kovacs, a three-year letterman and starter at safety, has opened 33 of 37 career games. He has totaled 266 tackles -- 21 for losses -- five sacks, four interceptions, two forced fumbles and three pass breakups in his career. Kovacs was named to the 2012 preseason watch list for the Bronko Nagurski Trophy and Lott IMPACT Trophy. A three-year letterman, Robinson has started 27 of 38 career games in three seasons at Michigan. He has completed 338 of 580 passes for 4,931 yards and 40 touchdowns and rushed 546 times for 3,229 yards and 35 touchdowns. He ranks in the top 10 in U-M history in passing completions, attempts, yards and touchdowns and in rushing yards, touchdowns and 100-yard games (14). Robinson was named to the 2012 preseason watch list for the Davey O’Brien Trophy and the Manning, Maxwell and Walter Camp Player of the Year Awards.